The Maloti Drakensberg Park, a World Heritage Site, should be a part of every journey to South Africa and this site will show you why. Artists, photographers, fishermen, birders, campers or hikers can escape to where you can breathe clean air under clear skies, the Southern Drakensberg will fulfill your hopes, time and time again. We offer more than 2500 beds in modern and comfortable hotels, lodges, B&B and self-catering accommodation and camping facilities. People here are very friendly and hospitable – we pride ourselves on warm welcomes and personal service. All year round, in winter snow or summer sun, the Southern Berg offers plenty to see and do. The Southern Drakensberg is big & beautiful and offers an enormous diversity of attractions and activities. Enjoy mountain biking, horse riding, trout fishing and much more! Explore a wealth of San Rock Art, as well as the local arts and crafts. You won’t find better countryside anywhere! 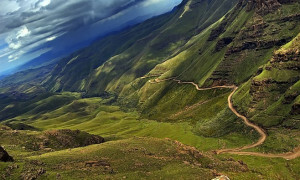 The legendary Sani Pass provides the only road link between KwaZulu-Natal and Lesotho, and is the only road crossing the summit of the high Drakensberg. What else can we do in the Southern Drakensberg? There are many other things to do in the Southern Drakensberg, our directory can help you find what to see, where to eat and drink and what to do. Keep an eye on snow report’s website and cameras for the latest snow updates in the Southern Drakensberg. Below is a live snow cam pointing down the Sani Pass.